On June 6, 2013 the choir celebrated the start of summer (and the end of choir practices till fall) with a pot luck dinner at the church. The food was excellent and entertainment was provided by Katie Dockstader and Ben Hearn. 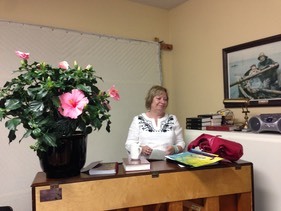 Louise Dockstader was honoured, for her dedication as choir master for the last 32 years, with a huge hibiscus.